Although the shootings at Kent State and Jackson State occurred 37 years ago, the tragedy at Virginia Tech on April 16 reminds us again of the horror of experiencing such violence on U.S. College campuses. Since the senseless massacre at Virginia Tech, this website has experienced an increased interest as people attempt to find historical touchstones in the attempt to understand such tragedies. 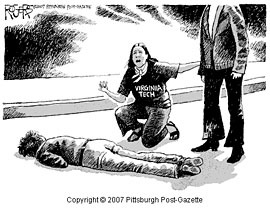 The Pittsburgh Gazette editorial page recognized the similarities in the horror felt in 1970 with that of 2007 with the stunning editorial of John Filo's 1970 Pulitzer Prize winning photo of Mary Vechio over the body of Jeff Miller - with one addition of dramatic license: "Virginia Tech" was emblazoned on Vechio's t-shirt. I have added a section on the Virginia Tech tragedy to the May 4 Archive website so that present and future readers can study the clear differences and similarities between the two incidents. The aftermath of the killings at Kent State presented a difficult time for the university as it attempted to move forward. 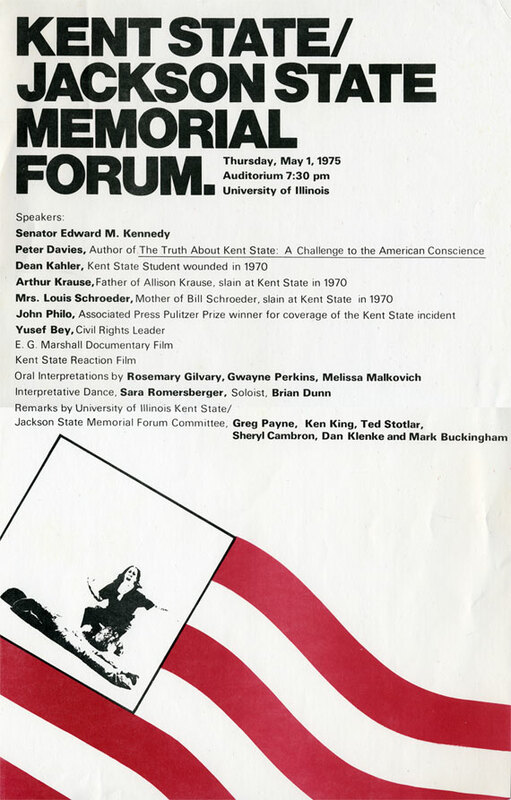 This included the feeble public relations attempt of changing the name of the University to Kent - as if this would help people forget what will be forever etched in our minds of what happened on May 4, 1970 at Kent State. It also witnessed a figurative and literal attempt of covering up the facts by Governor Rhodes with an ill planned gym constructed on the site of the practice football field where the guard regrouped just moments before the shootings. The objective of the this website is to be a source of historical and cultural knowledge of the shootings at Kent State. It is my hope that in the wake of Kent State, Jackson State, Columbine and now VA. Tech, all will reflect on the sanguine message of Santayana: "Those who cannot remember the past are condemned to repeat it." Alan Canfora recently released two versions of a 20-second clip — the original and an amplified version — in which he says a Guard officer issues the command, "Right here! Get Set! Point! Fire!" Kent State University President Lester Lefton has expressed solidarity with Virginia Tech, saying the Ohio school is an example of how an institution can rebound from tragedy. Fatal shootings at U.S. colleges or universities in recent years. "Campus Violence: The Virginia Tech Tragedy"